Lexis Nexis Academic database updated to a new platform, Nexis Uni. Use this guide to become familiar with this resource. What is Nexis Uni? Lexis Nexis Academic database was recently redesigned and renamed Nexis Uni. What does Nexis Uni search? This database contains news, legal cases, law reviews, company information and many other business, law and news publications ~ from over 15,000 fulltext sources. Content includes sources such as the New York Times, U.S. Supreme Court decisions, company profiles, and SEC filings. Is Nexis Uni available from off campus? Yes, Hewes Library resources accessed from off campus will first prompt the user for their Monmouth College username and password before providing full access. How do I search Nexis Uni? Tips on searching for news, business/company information and law resources are provided in the boxes below. Users may search across ALL Nexis Uni resources at once, or search in specific modules (news, cases, law reviews, company info or a specific publication). What are the new features of Nexis Uni? Annotate, highlight and save portions of documents: simply select the text you wish to annotate/save/highlight, and the changes will appear on the right hand side under the "Notes" tab. Save documents to folders and share the folders via email, download or Dropbox. Read more about specific types of searches in the boxes to the right. Nexis Uni offers broad searching across all content types (news, legal and company profiles) by using the top search entry. The Advanced Search allows searching in specific fields, like headline, title, publication, date, and company name. Searching by document segment can be helpful in finding specific results. TIP: There are Advanced Search forms for numerous content categories, including news, company and financial, directories and legal content. To search for company information (including SEC filings, company profiles, and analyst reports), select Company Info box and specific filter selections will be provided to help narrow the search. Select the BUSINESS image from the main Nexis Uni search page, then select COMPANY DOSSIER (see below). See the labeled tabs for types of searches possible (Find a Company, Create a Company List, Compare Companies). Find a Company allows keyword searching (also Ticker symbol). IMPORTANT: You may need to use the VIEW ALL button on the search results page to see all possible companies matching your keywords. The Company Dossier may include annual financials, executives, industry overview, news and legal information, and SEC filings. 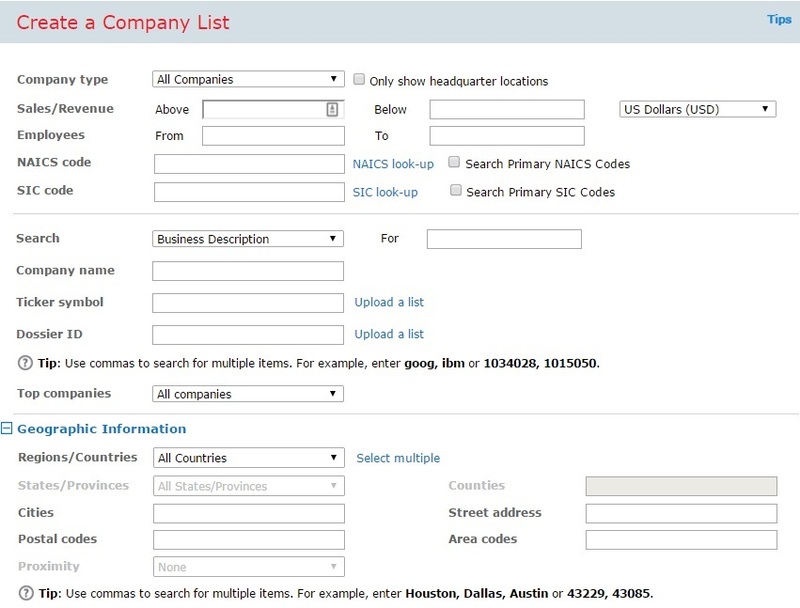 Create a Company List allows attribute searching. e.g. Illinois companies w/500-1000 employees. Compare (up to 5) Companies allows five comparisons by balance sheet, income statement and ratio information. Select the BUSINESS image from the main Nexis Uni search page, then select COMPANY DOSSIER (see below). See the labeled tabs for types of searches possible (Find an Industry and Browse an Industry Hierarchy). The Industry Dossier search results should include top companies and financials, most in downloadable Excel format. NOTE: Nexis Uni does not allow searching by NAICS code. SIC codes, if unknown, may be located in the Business Source Premier database in a company or industry article or report. To search news sources (including major newspapers, news blogs, and broadcast transcripts) select NEWS and search by fulltext keyword. Date limiting also available. Not included are state trials nor jury trials. To search legal cases (federal and state) or law reviews (articles in scholarly law journals), select the appropriate box (Cases or Law Reviews) and specific filters will appear to help narrow the search.